Don't get Whispers wrong, we really are fond of Fairfax Newspapers. Especially having worked for lengthy periods twice for them although the partnership didn't always end amicably. The real problem is despite Fairfax hosting some of the nation's best journalists, those in management are not newspaper people. They are businessmen looking at the bottom financial line and that isn't always a happy marriage. Say what you will about the Dirty Digger ( Rupert Murdoch) he employs expert experienced newspaper men & women to run his worldwide operations and that's why they succeed (hey and they pay on time !). So it's always sad when you see an obvious corker in one of Australia's venerable institutions and one we need so badly. 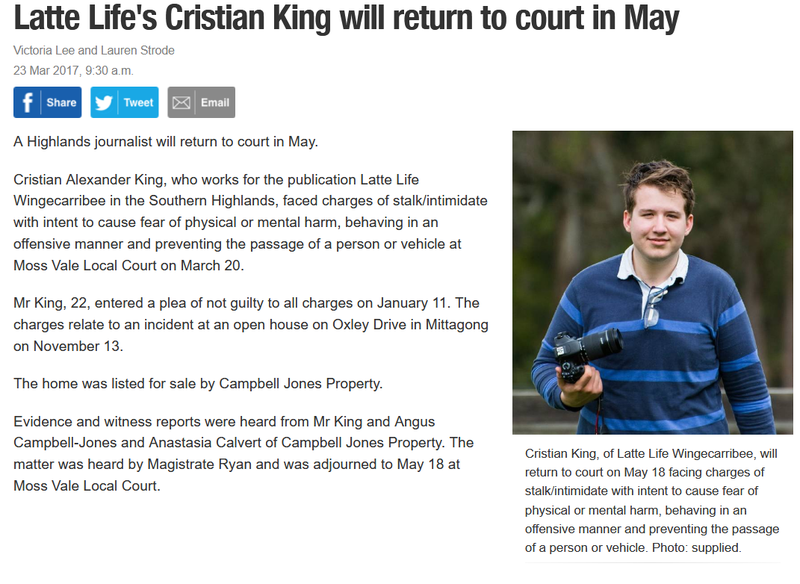 As in this report by the local Southern Highlands' Fairfax newspaper where two budding journos got it so badly wrong. Local newspaper baron Cristian King (pictured right with his Mum Jane) Australia's youngest newspaper executive and an editor at King Media is involved in a dispute with some local Highland's colorful characters. He's been charged with an offense but most certainly not 'stalking' a fairly serious offense as the local Fairfax newspaper alleges. Cris is in good hands though His brief is from one of NSW's best law firms run by Christopher Murphy. 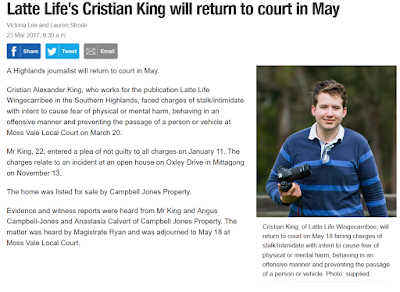 We reckon King will prevail in court. We don't think M'lud will be happy with the Fairfax report. Disclosure : Whispers has worked for Fairfax, Rupert Murdoch, King Media, Vanity Fair, the Wentworth Courier..oh hell, who haven't we worked for? And on the subject of King Media, Cristian and Jane King are about to launch their fourth local newspaper, The Independent Goulburn. This is the way of the future in print publishing - small independent newspapers will thrive. Take it as gospel from an old hack.